It’s Spring! 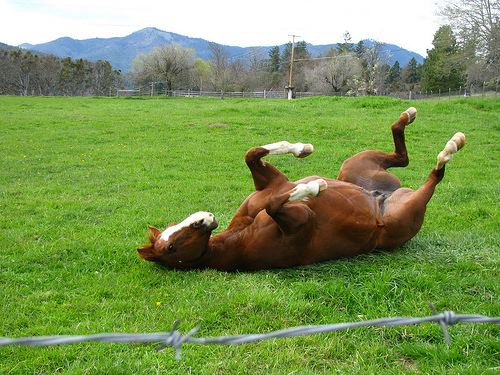 Does Your Horse Suffer From Allergies? It’s a beautiful spring here in Colorado! 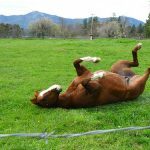 But while the budding trees and new grasses are always exciting to see after a long winter, many of us are experiencing the discomfort and misery of allergy season and so are some of our equine friends. Just as your eyes drive you nuts during a bad pollen season, allergies make your horse miserable. Allergies in horses manifest as watery eyes and itchiness, just as in humans. In a nutshell, allergies are caused by an overreaction in the body to a perceived threat that is actually a harmless substance, such as hay or pollen. The chemical reaction produces white blood cells in response to the allergen, which in turn produce an abundance of antibodies to perform a search and destroy mission on the perceived threat. These antibodies release chemicals and hormones called “mediators,” which include histamine. Mediators such as histamine activate more white blood cell defenders, as well as effecting local tissue and organs. 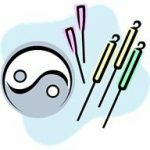 Acupuncture can modulate the over-reactivity of the immune system in an allergic reaction, therefore reducing the clinical signs of itching and hive formation. In Chinese terms, this is considered a Wind-Heat invasion and secondary Dampness; similar to western thought, the treatment aim is to assist the immune system, and improve blood flow to the site in order to remove swelling. Histamine has been shown to be augmented with acupuncture treatments, both locally and systemically. This photo is of the same horse that we saw in our previous blog posting about facial paralysis. She damaged herself trying to rub her face and head on the barn door in an attempt to relieve the itching caused by her allergies. This mare had inflammation in her eyes (called uveitis), and she was very itchy around the head. After three treatments, and much fly spray, her allergies were reduced and the strength in her weakened facial muscles was regained. Horses that suffer from allergies can also benefit from supplements that contain omega 3 fatty acids and other immune modulating support factors. If you have a horse that suffers from allergies, please ask us for more information on how you can help relieve the symptoms and make your horse more comfortable during allergy season.